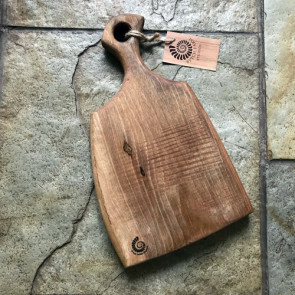 Hardwood serving and chopping boards made from native hardwoods, most of which are sourced local to our workshops here in South Shropshire. All are individually made. 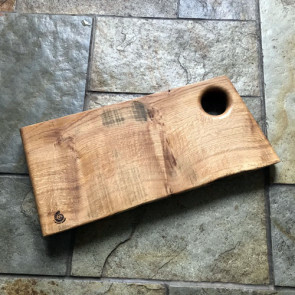 The one you see in the shop will be the very board you receive. 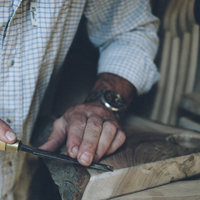 All our boards are made from a single solid piece of wood. Very much made with the Japanese 'wabi sabi' influence. That is, every piece of wood has its own story, patina, blemishes and quirks. A natural living thing, it is the tree that dictates the outcome not us. PLEASE TAKE THE FOLLOWING NOTE INTO CONSIDERATION BEFORE ORDERING YOUR BOARD. 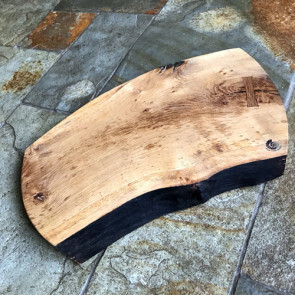 OVER TIME THERE IS A POSSIBILITY THAT ALL WOODEN BOARDS MAY TWIST OR CURL A LITTLE. WETHER IT'S ONE OF OURS OR ANY OTHER MAKERS. THEY RESPOND TO THE ENVIRONMENT AROUND THEM. MODERN HOUSES AND CENTRAL HEATING DRY OUT THE AIR, AND THEN ARE OFTEN VERY HUMID, DIRECT SUNLIGHT, ALL THESE THINGS CAN EFFECT YOUR BOARD. 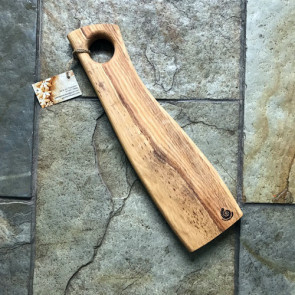 IT'S WORTH REMEMBERING ALL PROFESSIONAL CHEFS PLACE THEIR BOARDS ON A TEA TOWEL TOP STOP SLIGHT ROCKING AND PREVENT SLIPPING. Our usual woods include Oak, Ash, Elm, Walnut and Plane Tree. Others such as Apple, Pear and Cherry sometimes make an appearance. It just depends what we have been able to source locally, usually wind falls or condemned trees.